I began collecting music applications, downloading them, trying them, and if they seemed promising, I would begin recording in earnest with them. I was an early adopter of “scape”, I downloaded it the moment I became aware of it, and I did publish a number of my early scapes on both sound cloud and you tube. the problem though, with scape, is that it’s very easy to sit for hours and hours, and create many different scapes and variations of scapes...and very quickly indeed, I ended up with a very large number of recorded tracks (at this point, in summer 2013, there are nearly 1100 scapes recorded). realising that I would be hard put to make a video for each and every one of nearly 1100 tracks, I hit upon the “eternal album” concept, which would allow me to upload completed tracks, and add more tracks as they become available - the perfect solution - a way to present this very, very large body of work - over time - lots of time. I also recorded many, many other pieces with many, many other applications, and in fact, in this year and a half period, I became so incredibly prolific thanks to the ipad and thanks to the incredible number of really robust, powerful music applications, that it took me some time to come up with a solution for how to make this “new music” available to listeners - and it was then (probably in about mid- 2012) that I hit on the concept of the “eternal album” - which I describe in detail on the bandcamp site for this album. it took me about a year to work out how the eternal album would “work”, and this summer, in june, 2013, I sat down to remaster the entire dave stafford “scape” catalogue for the express purpose of making it available in this new format, the “eternal album” - on bandcamp (which has the advantage too, of allowing folk to listen before they buy - a very important feature that I heartily approve of). in brief, the “eternal album” is an open-ended album, with no finite number of tracks, and no completion date - I will continue to add tracks to it as they become available. in this first instance, I’ve uploaded all of the existing, available scape tracks initially, and then over the coming 30 - 40 years, I will simply add more and more tracks as I create them - and whatever the current total of available tracks is - “that” is the “album”. obviously, customers can pick and choose what tracks they like, and create their own “version” of the “scape album”, with as few or as many, or all of the tracks, if they so desire - a very flexible arrangement I feel. 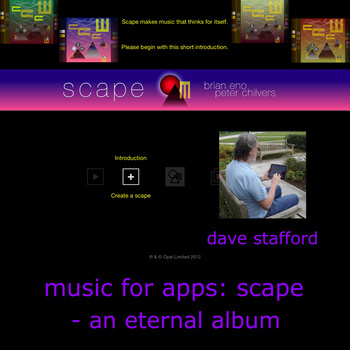 “music for apps: scape” is the second of many “eternal albums” that I foresee, each album focusing on music made with a specific ipad application - this one of course, is all about scape - the generative ambient music creation app created by brian eno and peter chilvers.